Over the past few years, my love for all things botanical has grown some what. 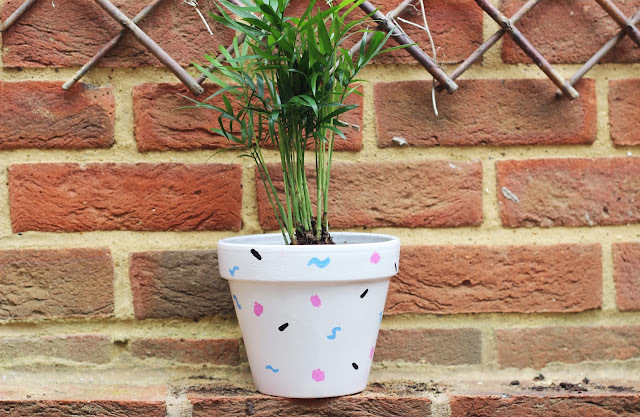 When we moved from an upstairs flat to our current home with its little courtyard garden, we started to build a collection of potted plants. We grew things from seeds such as tomato plants (which are now huge!) and collected new shrubs to fill our home and garden every time we popped to the market at the weekend. It is not only rewarding but makes your home look so pretty and colourful! This was a really fun project which is very simple but allows you to get very creative! Choose colours and designs that match your decor or go as colourful and loud as you like! I wanted to show 3 easy ways of doing this taking inspiration from different styles. 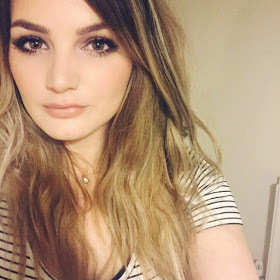 Watch the video to learn the process and make sure you read to the bottom of this post for my extra tips and advice! My first idea was inspired by the many Scandi style prints and colours that are so popular at the moment. I love the combination of the light blue in contrast with the black lines. You could do the same style but with pastel pink, peach or mint green and make a little matching set. 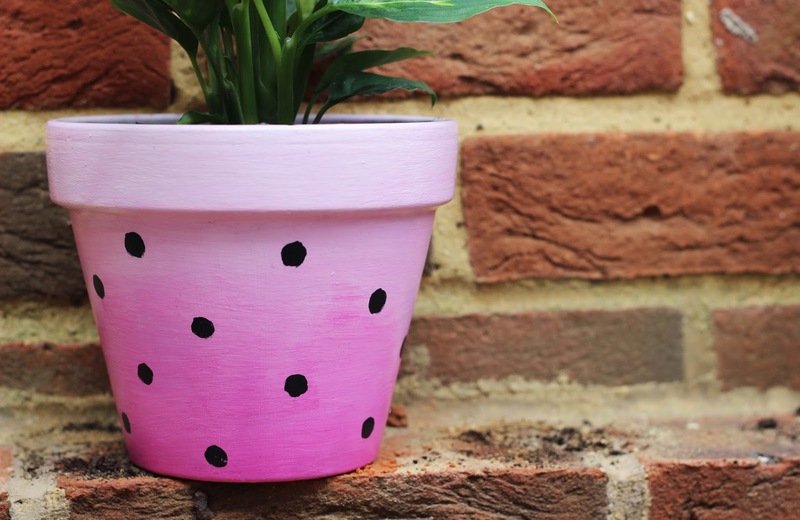 The next design was inspired by all things kawaii, I liked the idea that with a leafy green plant in this pot it mimics the colours of watermelon! I think the ombré fade is really effective and again could be recreated with different colour combinations. My final design was inspired by all things 90's...Think Saved By The Bell! If you look at any kind of 90s print, they are mainly made up of lots of small shapes and squiggles and I think they look really effective against the white background. To avoid the pots weathering, it is best to keep them indoors. 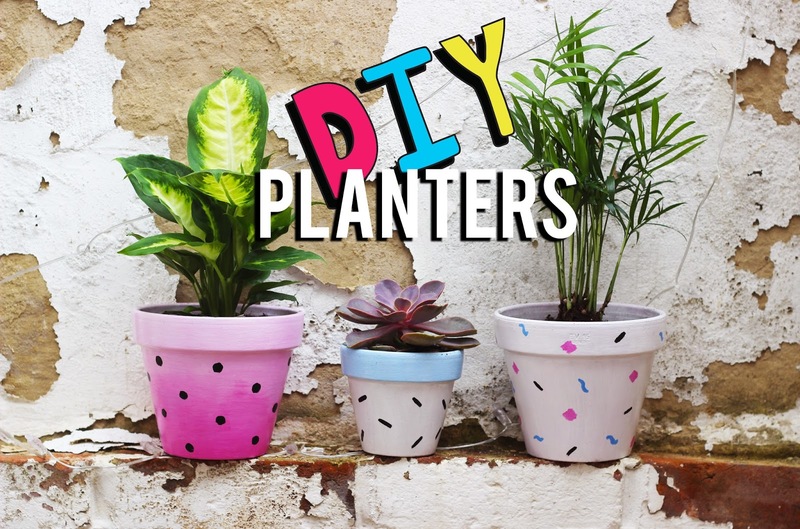 So fill them with your favourite house plants! I think the small Scandi style design would look great as a set of 3 in a bathroom. Make sure to do a least 2 coats of paint for each layer. Terracotta planters will need the build up of paint to avoid the stark orangey tones coming through. A varnish will help the durability of the paint over time and will avoid it flaking. 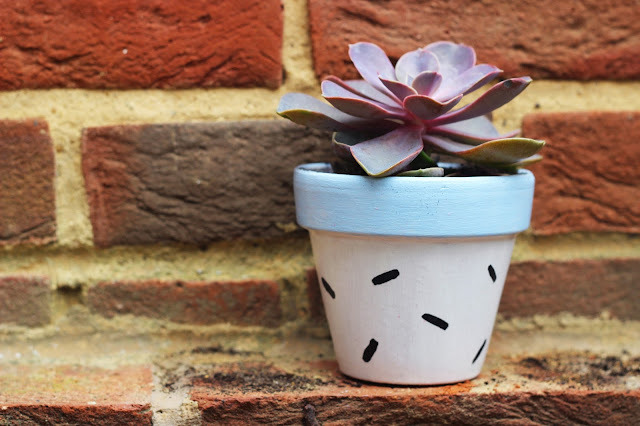 I used trusty Mod Podge but if you use something a bit more heavy duty, it would allow you to put the pots inside or out without any worries. Make sure to paint and varnish the inside rim of the pots. This will give an overall neater and more professional look once a plant is potted. 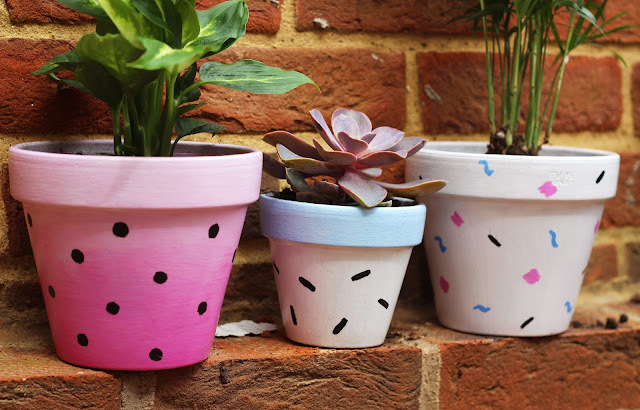 I really enjoyed decorating these pots and I will definitely be making more in the future! Let me know if you try any of these, I would love to see your recreations! I seem to never have enough trinket dishes in my home. I'm always looking for pots and trays to gather my art supplies, jewellery and generally just clutter that has accumulated in various places. A perfect way to tidy a messy desk! I used air-dry clay for this project but polymer would work as well. 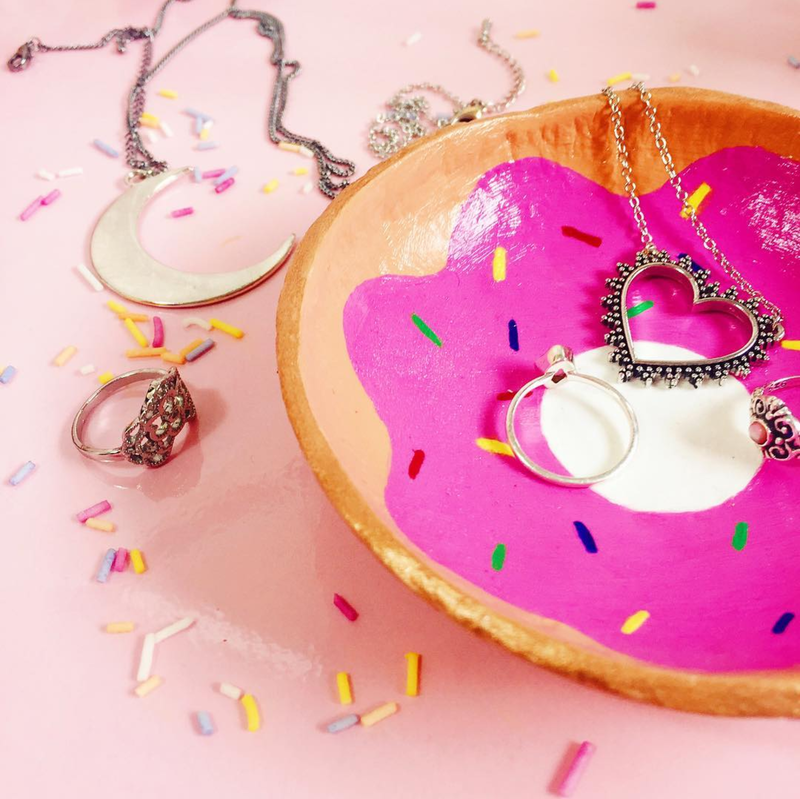 The issue with polymer clay is that it has to be oven baked so keep that in mind if you are forming the shape using a bowl. Air-dry clay is very easy to use but can dry out quickly. Be sure to have a bowl of water near to keep the surface supple. 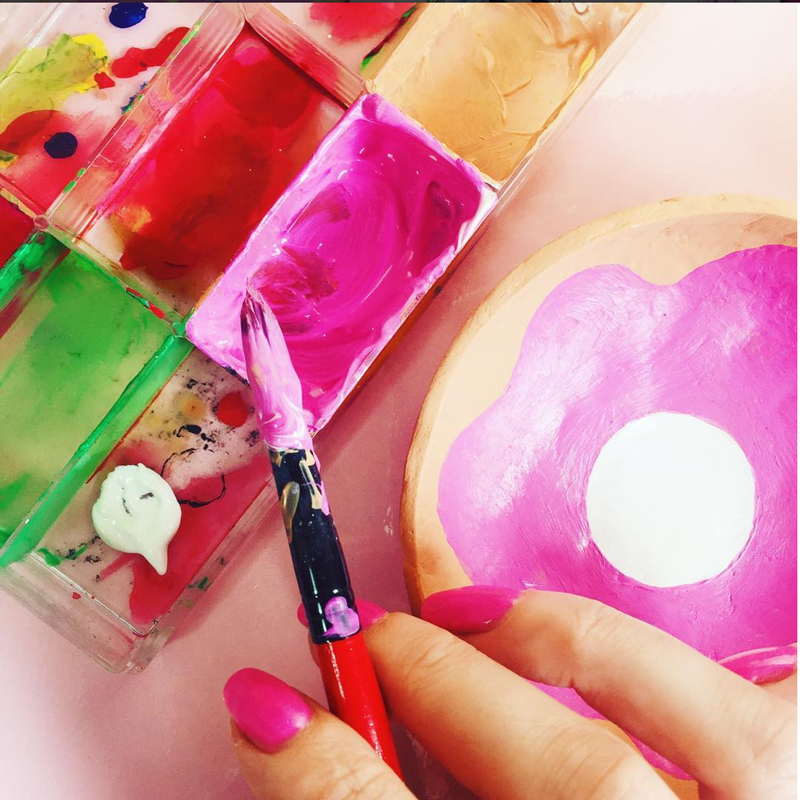 If you build up the coats of paint, the overall colour will look far better and more opaque. I know this might sound obvious but it is definitely worth the additional drying time between coats as the final look will be far more professional. I would recommend varnishing your final piece, I used Mod Podge as it is perfect for a project like this. It will add to the durability as well as protecting your painting surface from scratches and making it very easy to clean. Let me know if you try this project, I would love to see pictures of your recreations! I'm feeling far more optimistic about August, I'm going to set myself some solid goals and really commit to achieving them. I did manage to tick off one painting project in the past week that had been weighing heavy on me for a little while. So finally having that completed gives me time and energy to put into new projects. 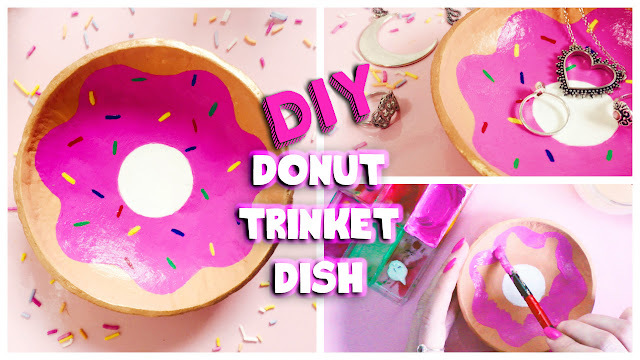 I have 2 new DIY tutorials going up this month that I'm excited about (so look out for those!) and I have new commissions to get started on, as well as building up new stock for my Etsy shop. One thing I was really inspired by in July was a long weekend away I had by the seaside. It was a really fun and relaxing few days away and made me think about how much I love the colours and traditions of a British seaside town. 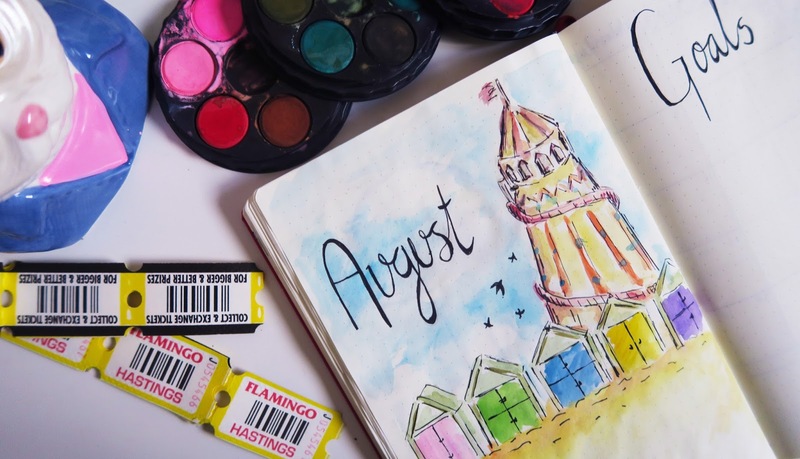 So, I decided to make my August set up based on the seaside! I really enjoyed making this one (watch the time lapse below) it made a nice break from florals! I also enjoyed experimenting further with watercolour in my monthly layout. I love the blue and pink colour bleeds inspired by good old seaside rock. I definitely want to incorporate more of this in the future. 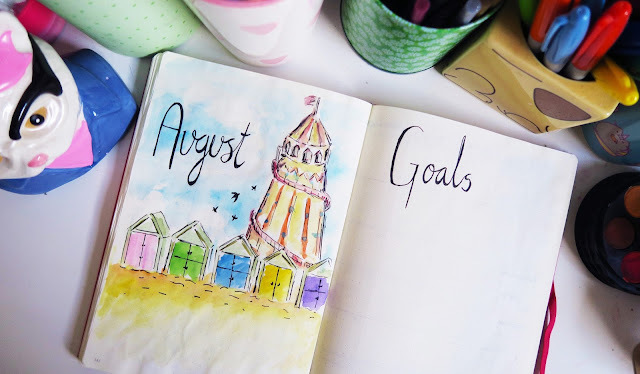 Have you set your goals for August? 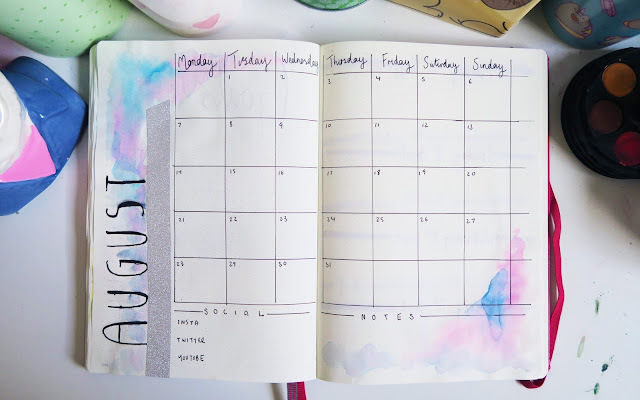 What are you hoping to achieve this month?